Home / Promotion / Why camp when you can glamp? Hard to believe, but some people think of camping as ‘roughing it’ and have a bit of a hard time stepping away from the sofa! If that sounds like you, then we might have the answer with the Quest Elite Signature range of Bell Tents, brand new for 2019. 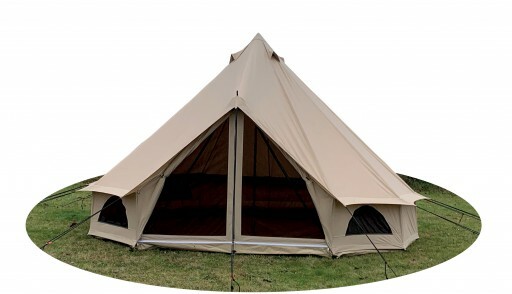 Glamorous camping or clamping really is a thing and new for 2019 are these great bell tents. Make it a home away from home with luxuries like an air mattress, portable cooling or a heater and lighting. These could include furniture and great tableware so you can really relax and enjoy your time in the great outdoors. 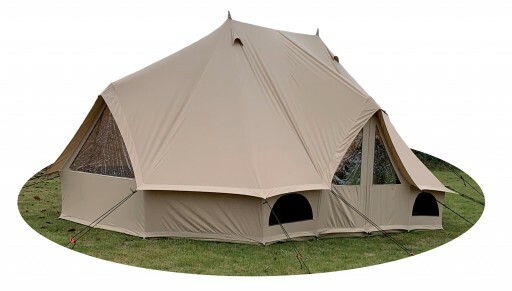 A premium-quality cotton canvas frame tent with an extra thick PVC zip-in groundsheet makes this a fantastic family-friendly tent, or perfect for a couple who want that bit more space. And this simple steel-framed tent can be put up by one person, making it one of the easiest tents to erect. In the summer, the 100% cotton canvas is breathable and will keep it cooler compared to typical polyester and polycotton tents. Yet in the winter, the insulating properties will make it warm and cosy so you can camp all year round, safe in the knowledge that you made the right decision. We have the Touareg erected and on display as part of our massive tent and awning display at Devon Outdoor in Barnstaple, North Devon and will soon have the 5m Bell Tent up at The Camping and Kite Centre in Raglan, near Abergavenny. So if you’re passing by or near one of our stores, pop in and take a look around! Previous post: Spring is here … are your ready for your first camping trip? Next post: Tent & Awning Display Now Open!